Cast of Impractical Jokers are coming to the LIVE stage as they take to the road this Summer! 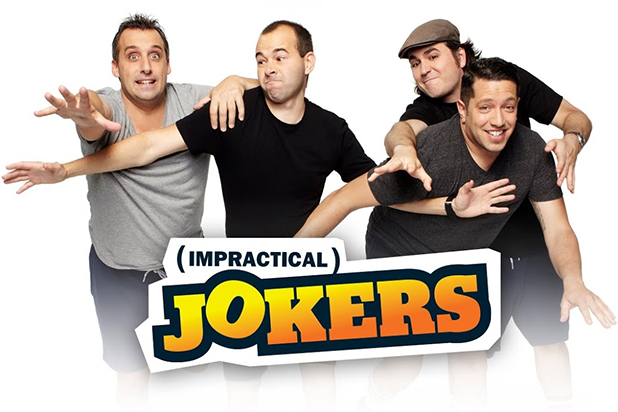 If you love the show then come and be a part of the crowd at Shoreline Amphitheatre on Sunday 4th August 2019 as The Cast of Impractical Jokers come to blow you away with their hilarious tricks and pranks to the stage! Tickets are now available to book online – secure your seats today! The Tenderloins, the improv comedy group are best known for their hit comedy series "Impractical Jokers" on truTV, will bring their special blend of comedy show to the stage at Shoreline Amphitheatre. The successful combination of comedians, consists of course of Joe Gatto, James Murray, Brian Quinn and Sal Vulcano, are currently in their sixth season of ''Impractical Jokers'' and are currently touring across the road with their “Santiago Sent Us” Tour dates!